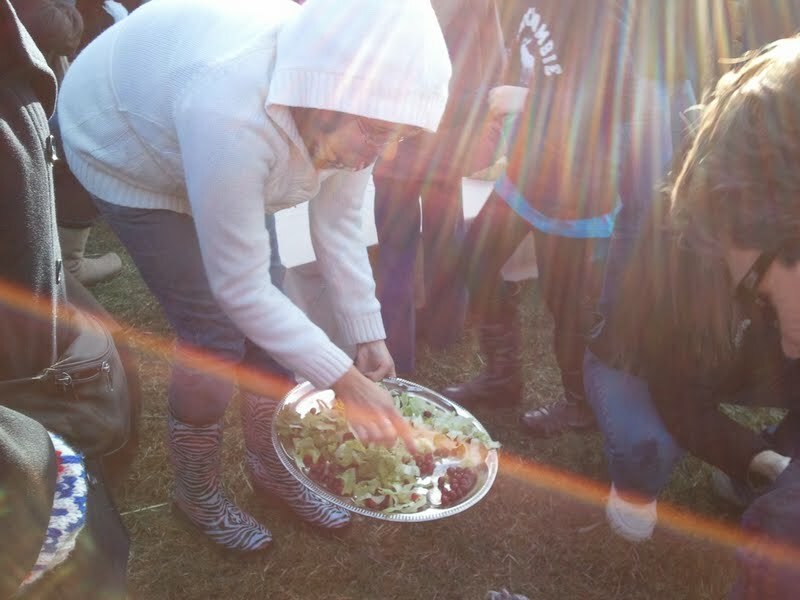 The food at the Farm Sanctuary's annual Celebration for the Turkeys, was amazing! My next post will be to re-create one of the dishes served. So please, cast your vote and I will make my version of it and post the recipe! If I do not receive any votes or feedback, I will simply choose for you! 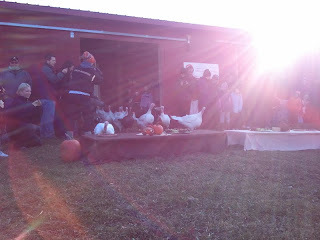 At the farm was amazing hot cider and yummy teas, pretzel snacks, and yummy Newman O's. But at the dinner was where they pulled out all the stops. The hotel put on quite the vegan spread indeed. There were appetizers and hor dourves galore! Bruschetta, veggies and dip, crackers, stuffed mushrooms, breads, olive oil dipping sauce, tepenade, assorted fruit, just to name the ones I can remember! There was a really beautiful salad also, to start. The soup was a pumpkin bisque with puffy, almost cracker-like croutons. That was the best bisque I have ever tasted! Dinner was a buffet style, nice touch for us hungry vegans! What I really enjoyed about this year's meal, was that you could now choose from Tofurky or Field Roast...or both, which I did! The Field Roast was likely their Celebration Roast with stuffing and is a nice flavor, different than Tofurky, just as nice, and very palette pleasing. 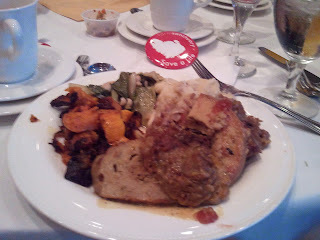 The buffet also offered stuffing, amazing sweet potatoes, a beans and greens dish, and mashed potatoes. It all was heavenly to say the least! Dessert was crazy good! 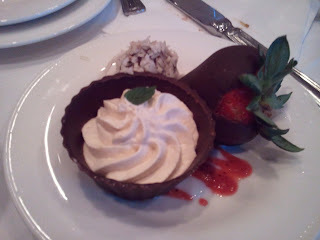 Dessert featured a nice mousse, likely white chocolate flavor and was in a dark chocolate shell, a chocolate covered strawberry, and a nice coconut covered truffle. The presentation was beautifully done! The venue was amazing as well. It was a night to remember and it felt amazing to be there. We are making a difference. Again, I will create a Dirty Vegan version of one of these foods mentioned, please cast your vote and I will oblige. 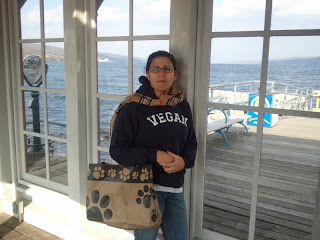 You can vote by commenting to this post or by e-mailing me at thedirtyvegan.blogspot@gmail.com. I will also accept facebook or other online requests, for the vote. The Dirty Vegan Loves Watkins Glen Vegans, Part One! Before we head over to the farm to visit all the beautiful beings that live there, we did some shopping. There was a consignment shop where the workers are solely volunteer. All the profits go to the local animal shelter. I had the pleasure of meeting Thumper there. Thumper is the sweetest boxer. Thumper had scars and was badly abused before he was rescued. However, you would never know Thumper saw abuse by the hands of humans. He loves humans and the entire time his tail never stopped wagging. This weekend in Watkins Glen, it was hard to hold back the tears. Tears of many different emotions welled up inside me during this visit. I was sure to buy one of the most expensive designer dresses at the shop. It benefits the animal shelter...and I am the Dirty Vegan, a diva (as you can see with my designer look-a-like acrylic scarf, above). First stop, the cows.This beautiful girl is Rhonda. Funny story: my husband kept calling her Larry (the cow beside her was Larry). Well, Rhonda did not like being called, Larry. The more my husband called her Larry, the more and louder she groaned and mooed, until I finally told him that she was Rhonda, not Larry. She seemed fine after that, and he apologized to her and rubbed her. Rhonda was amongst some of the older and special needs cows. You can tell she had been through so much at one time in her life. You could just tell she had a story. Just like Thumper, you can see that these animals have been through the war, but keep on going, they trust us humans again, they don't have to, but they do, they want to. They are not the stupid ones for trusting humans after they were abused by them, it is the humans who are stupid for abusing these gorgeous creatures. Every life has intrinsic value. These animals have lives, friends, feelings, fears, hopes, feel pleasures, they grieve and are animals just like we are. Just because they are different than a human does not mean we are to exploit them. Just because they can't talk, does not mean it is right. They do cry out in pain. Can you think of any other instances where mass abuse occurred to other groups just because they were different and we didn't accept them? 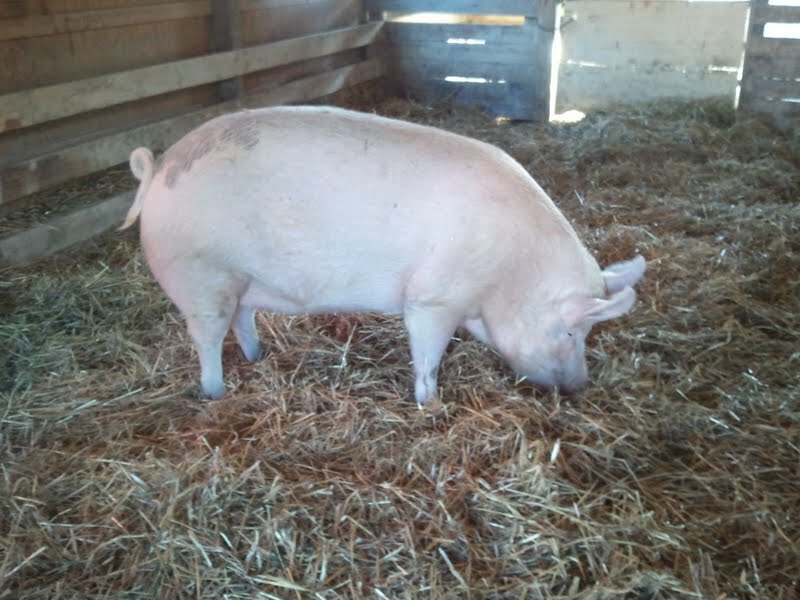 Some more funny stories from the farm: my husband got right in the pig barn and proceeded to rub pig bellies and they rolled over to enjoy, and later, fall asleep. I on the other hand, was scared of the pigs (I know, weirdest vegan ever, right). They were just so big and powerful and walking around faster than the cows were. I rubbed them but wanted to go into the piglet area, where I thought I would feel more at ease. Well, piglets are feisty. Now when I say piglet, I don't mean first day after being born piglet, I mean 200- 300 pound feisty piglets. Well one tried to get over to the adult pig area and stepped on my foot. It hurt, but I didn't even flinch. I wanted to be calm, after all, I am in their home. I could only imagine how excited and anxious all the animals were that day to have so many humans around. All the smells and excitement. I would probably be a little taken back if I had 100 different unfamiliar animals touching me and hanging around in my home! The pigs were darling and they make the cutest noises! Needless to say, next year, I will hang with the older pigs. Yes, they are very large, however, they are experienced and quite calm. All the pigs were amazing I must say. Each one had its own personality. The piglet seemed to listen to me when I tried to distract it, and its big adorable nose smelled and nudged me. My heart was melted, for the umpteenth time that day. People also do not realize how truly smart pigs are. I think the statistics show that a juvenile pig is smarter or equivalent to a 3 year old child. I don't think you would want to abuse, mistreat, torture, torment, slaughter, then eat, your 3 year old, do you? I know I wouldn't even dream of it. I don't even kill bugs! Another funny one: every year I see an adorable, resident black cat at the farm. It is always walking around. Last year I went up and gave it a gentle rub. Last year it hissed and ran away. We laughed our heads off because it was simply the cutest little cat ever. This year we spotted the cat again. I walk up to it, slowly, and give it a gentle rub. It seemed to like the rub...until proceeding to whip it's head around and bite my hand. I had a glove on, and it didn't bite hard, just enough to tell me something. Either a love bite or a "leave me alone" bite. Regardless, we laughed our heads off. Still the cutest cat ever. Then we waited. Sat on hay bails. 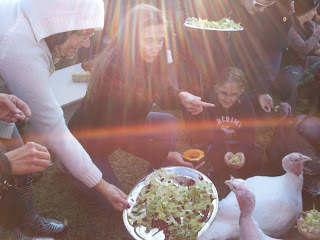 So excited to feed the turkeys and watch them eat their Thanksgiving Day feast! Here they come rushing in. Last year there were significantly less people, so they were all over the table, eating pies, fruit, and squash. This year they seemed more curious about us. They came over to check people out. 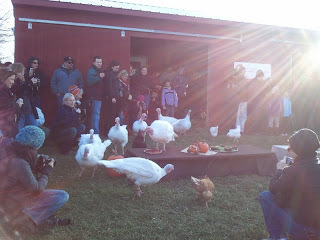 The more seasoned turkeys went right for the food immediately. Many people don't know what goes into a turkey on your table. It IS very much an animal. Don't you dare disassociate that fact. 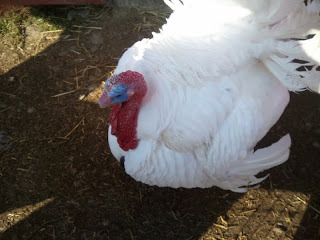 If you eat a turkey, own up to it, don't try to justify it by dumbing them down. They are brilliant animals. They make beautiful sounds, each meaning something different that they feel, they form bonds, they love life. 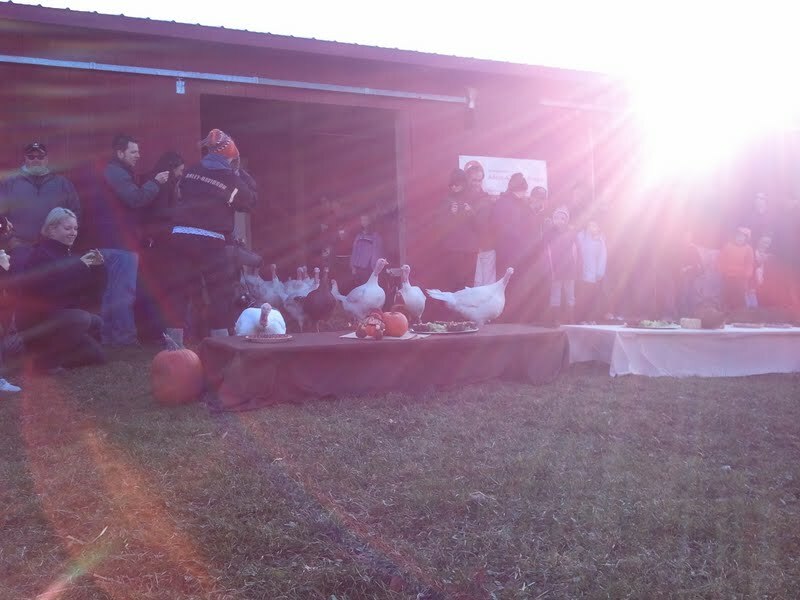 These turkeys pictured had the opportunity to be rescued, sadly unthinkable numbers of animals are slaughtered each year﻿ for Thanksgiving. They have a long tortured road ahead before they make it to your table. Their most sensitive body part, their beak, in which they use to communicate with their world, is chopped off, then off with their toes, they then suffer in factory farms (if they don't die before then, most of them die - for what?). They are not allowed to do the things that their natural instincts beg of them. They are unable to roost, bond, and so many other things that we enjoy watching our cats and dogs do, and things we enjoy doing ourselves. 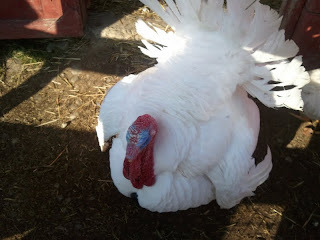 Did you know that turkeys raised for food cannot even mate and reproduce on their own, due to genetic mutilation? These turkeys have been altered in such incredible ways; the turkeys people buy already dead in supermarkets are the product of artificial insemination. My question is, how can anyone expect to feel good, mentally and physically, when they consume fear, trauma, cruelty, abuse, and angst? Humans know when we are in danger, we feel it. You better believe animals know they are about to die. I noticed a very significant change in my mood and life when I went vegetarian many years ago. Then when I went vegan it refined. Life begins falling into place. You start to see things differently. People look at me as strange. I can just as easily look at people who eat animal as strange. I can't wrap my head around how someone can eat their friends. 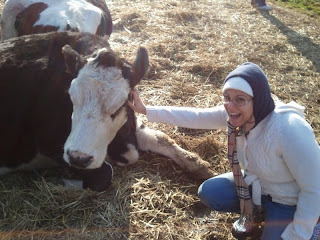 I watched Susie Coston at Farm Sanctuary. She is an angel to animals. She has such a beautiful soul and a heart of gold. These animals are her life and what she does is simply amazing. To just watch her interact with the animals is wonderful and inspiring. My experiences at the sanctuary are beyond physical. One of the speakers at the dinner later on, described being at Farm Sanctuary as "spiritual". I can totally understand that. These animals have been saved. Saved from horrible fates. It reminds me of those movies where there is terrible Armageddon-like activity, and you know at the end, when it all settles, and the few that made it out alive, are in a sunny safe place. They saw the battle, they were in the war, they are healing from the wounds, they have the scars, but they eventually find peace. My heart grew three sizes this Thanksgiving. For all the animals at Farm Sanctuary who found peace. To all their friends who didn't make it, who only find peace when their heart stops beating. To all the animal angels who work for, volunteer, support, and donate to Farm Sanctuary. Bless your heart and Happy Thanksgiving. For now, the Dirty Vegan is signing off. Toast the waffle in your toaster. When it is to your liking, spread the peanut butter on it. Then, arrange the banana slices on top. Finally, if you choose to drizzle some pure maple syrup on top, now is the time to do so. Enjoy! This is a really quick, yummy, and nutritious "fast food" breakfast. You are getting your protein, your healthy fats, your fruit with the banana, and antioxidants with the blueberry waffles. I chose the gluten free waffle because it seems to be easier to digest. This breakfast idea can be easily adopted by people with gluten intolerance. Also, this breakfast seems to keep me going and is very satisfying. When I eat this for breakfast, I'm not wolfing down a Primal Strip five minutes later...well not always. Chop the Tofurky sausage into small pieces, place in a microwave safe bowl. Add to bowl frozen peas, cheese, and the liquid aminos. Microwave for 1 minute, stir. If the cheese isn't perfectly melty, microwave for another 30 seconds. Stir and spread on wrap. Roll or wrap up in your desired manner. Enjoy! This recipe (depending on what wrap and other ingredients you use) should be about 34 grams of protein! A serving of Tofurky Sausage is 29 grams of protein, and the Lavash bread wrap that I used was low carb and had 5 grams of protein. This tastes almost like a pepperoni pizza! 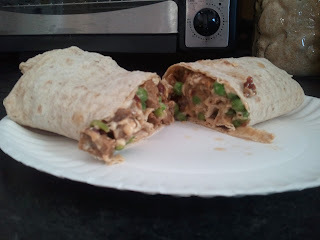 The Daiya makes it so melty and cheesy, I sneak the peas in, which are such a great touch and add some veggies to this. It is just perfect and you must try this out! Place all ingredients in microwave safe mug. Microwave for 1 minute. Stir well until chocolate chips are almost melted (use oven mitt, will be hot). Microwave for another 30 seconds more. Stir well. Enjoy! 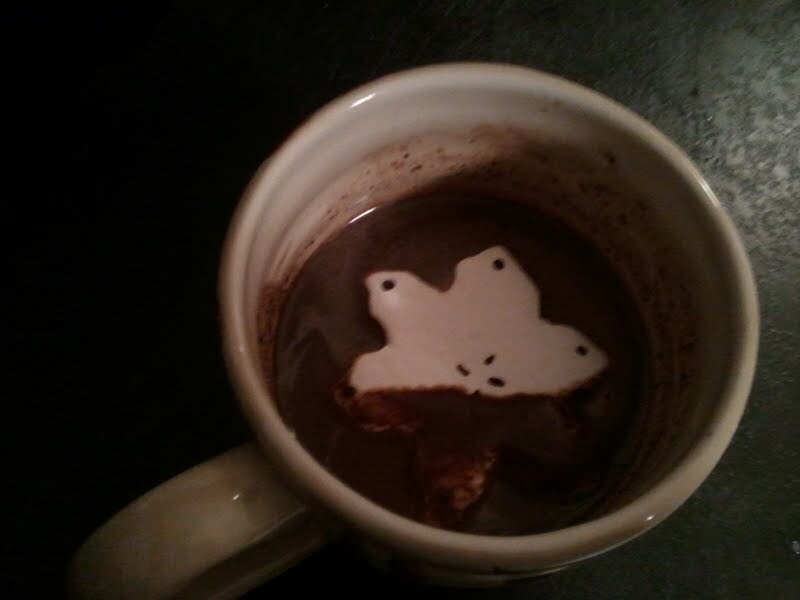 Since this recipe is inspired by one of my favorite vegan goodie makers, Sweet & Sara, it is highly suggested you float a Sweet & Sara vegan marshmallow in your hot cocoa. Pictured above is their delightful snowflake. So very yummy! The cold weather is approaching. Wintertime has some people thinking, "How will I keep warm and be vegan?". Have no fear! You don't have to freeze because you are being kind to animals. Wool is not the only warm material that clothing is made out of. And yes, you too can wear a stylish peacoat. You just have to read those labels and also know where to look. Some stores or brands make all man-made material coats regularly. And good news, most of the time they are way cheaper than wool. So the animals are not the only ones thanking you, your wallet will be too! This adorable jacket is by Rampage and is found at Macy's for a sweet price. It is made out of polyester, cotton, acrylic, rayon and nylon. I have also seen jackets that are non-wool and do not contain silk lining at TJ Maxx, Marshall's, Nordstrom, Northface, ﻿JC Penny, Old Navy, Urban Behavior, Aeropostale, most mall stores, just to name a few. All very fashionable, all great priced, and all easily obtained. Vegan stuff does not have to be hard to find. It really is just regular stuff without animal products. I think most people assume that a nice coat must be made out of wool, that is simply not true. I have designer jackets and trench coats that are all man-made, and they are fabulous. 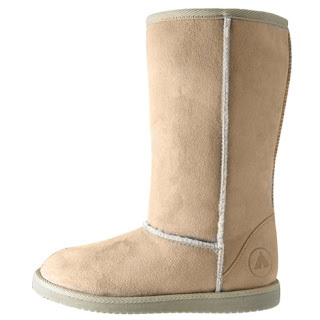 This is the time of year that people want to break out their Uggs or their look-a-likes. Well vegans don't have to miss out on the fun, and can still look great! Think, no sheep or calf skin, just a pair of boots you can be proud to wear. Airwalk (you can find this brand at Payless, or shop on Airwalk's official website) has a boatload of vegan shoes. These all man-made material boots are faux suede and faux sherling lining. I have a pair similar to these that I scored at Payless and I get so many compliments on them. These are not going to run you a mint either. It is nice to pay a small price for something fantastic. Imagine spending so much money and getting mud on and ruining your Uggs? I wouldn't, even if I weren't vegan, it is just ridiculous. 100% acrylic hat from Old Navy, score! 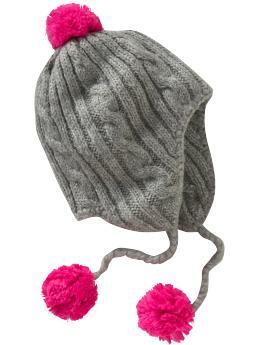 Old Navy has such a great variety of hats, gloves, and scarves, that are vegan. Just read those labels to be sure; most are vegan however. You can find scores like this at so many other stores, just look around. So basically folks, you can be vegan, still be stylish, and stay warm in this chilly autumn weather and approaching winter season. Keep a look out for great deals like these and be sure to always read those labels. For now, the Dirty Vegan is signing off.